Do you remember the giant Pom Pom Wreath I made last autumn? I actually was packing it up last week and it made me want to make another pom pom project. 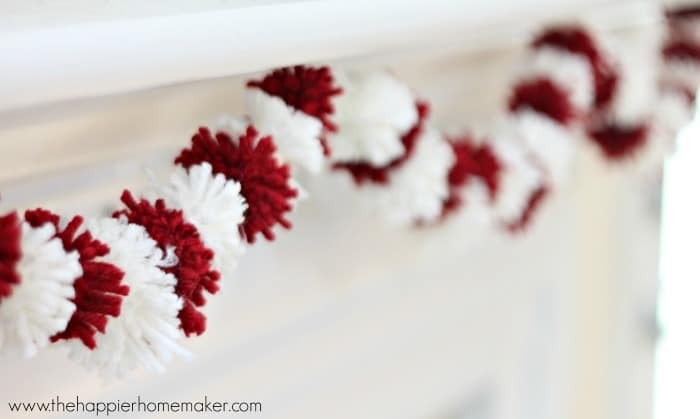 I raided my stash of yarn and found some red and white yarn that were just screaming to be made into a Valentine’s Day project-I decided on this pretty little mini pom pom garland. It was so easy to make and could be adapted for any occasion or decor by changing up the colors-I love the whimsy of it! Start by winding your yarn around the tines of a fork-I used a large serving fork for these mini pom poms and found that winding 25-30 times gave me nice dense and fluffy pom poms. 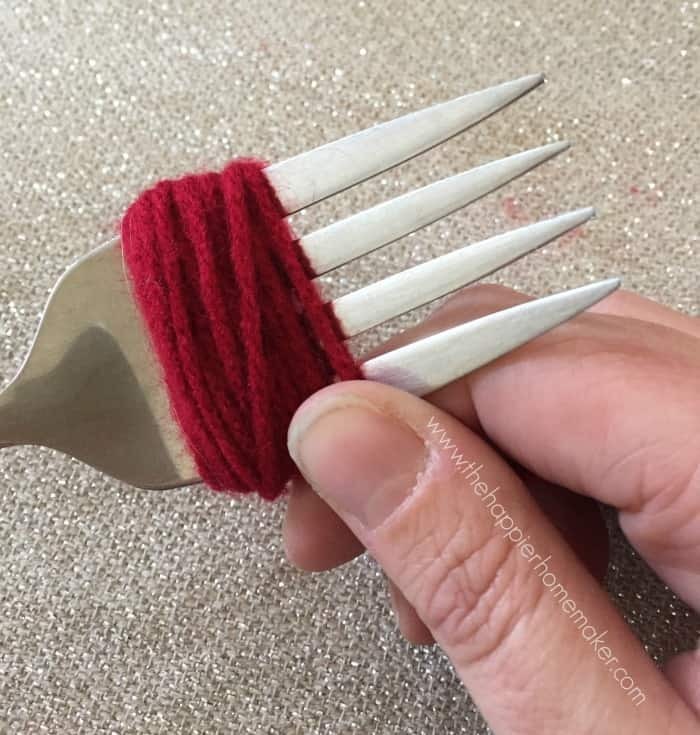 Cut a 3-4″ piece of yarn of the same color and thread it through the middle of the fork tines and tie a knot around the center of your wound yarn. 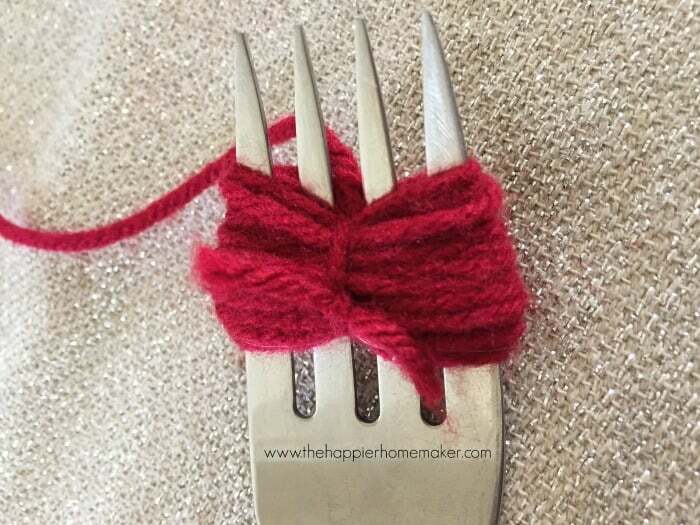 Carefully slide the yarn off of the fork and use scissors to snip the loops on either end of the tie. Trim any longer pieces to shape the pom pom. When you have all of your pom poms made thread them into a garland using yarn and a crochet needle through the center of the pom pom. This looks so cute up on my work-in-progress Valentine’s Mantel and it is really motivating me to make a fun multicolored garland to decorate our homeschool classroom. What do you think? Anybody else like a good pom pom as much as I do? This garland turned out great! Thanks for the easy instructions on how to make the pom poms. Pinning! I love a good pom-pom! I’ve been thinking about making some for our mantel. Very cute. 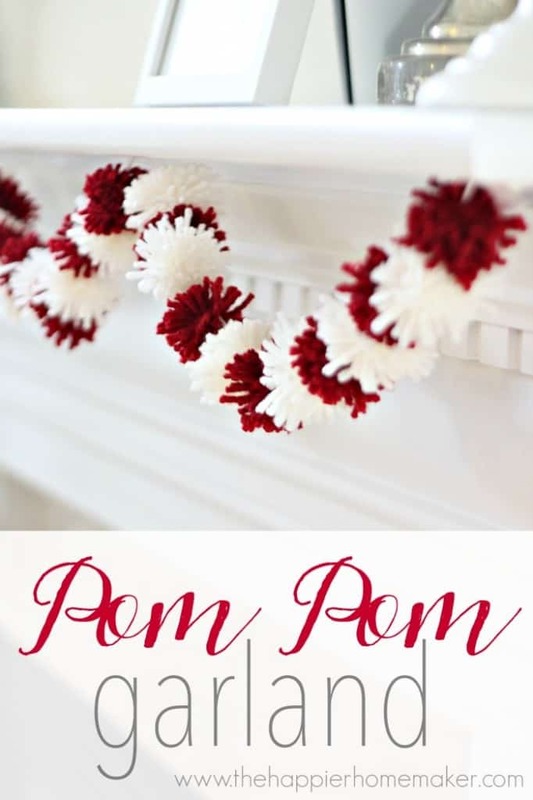 I am going to make some pom pom wreaths! I LOVE this. I’m making one tomorrow for our mantel. Thanks! !